I finally completed my first corset and it's nowhere near perfect, the inside is a little bit of a mess and I I don't really have any desire to make another one anytime soon but I think I remember saying that about the first pair of stays I made too! I have to say though... for me at least, 18th century stays are SO much easier than making a corset! It's a single layer of white cotton fabric that has a design in it but you would have to be up close to see it. I bound it with blue for a pop of color. Since I've never made a corset before I actually used the front closing from an old 1860 one of mine I don't use anymore. I may have also used the back lacing part of that corset because I don't have an eyelet puncher (or whatever those things are called!) which doesn't help improve the looks of it... but.. I couldn't justify buying one because I just don't ever have the need to punch metal eyelets. So overall... I'm not exactly pleased with this, I'm almost a little embarrassed by it but I keep reminding myself it was the first corset I've ever made so it's okay if its slightly wrinkly and a little wonky in places. It does look better on though, and I think if I can get around to making some sort of chemise or whatever would typically go under it, it will look even better! Pattern is from this website. It's the second to last pattern on the list. Aww! I think it looks nice! 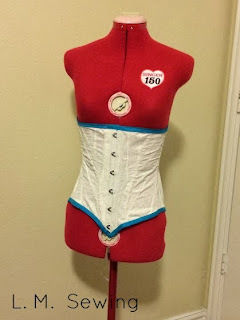 Corsets are one of those things that one needs lots of practice to get to look *really* good -and unfortunately that means making a lot of corsets! I'm certainly not very good at it myself, though I have improved since my first one (and you will too! ); I vastly prefer making stays too!